After Bran Stark’s near-fatal fall, Catelyn Stark suffers an emotional breakdown that leaves her by her son’s bedside at all hours, weeping and unable to care for the wider world. This ends when an assassin tries to kill Bran, as she fights savagely for his life and her own until Bran’s direwolf intervenes. Coming to her senses, and learning that the assassin used a Valyrian steel dagger, she concludes that someone wanted Bran killed for a reason and believes that the Lannisters are the likeliest culprits. She travels alone with Ser Rodrik to King’s Landing to try and meet Eddard secretly to inform him, but is intercepted by Varys and Lord Baelish, whom she knew as a child when he was a ward of her father. From Littlefinger she learns that Tyrion Lannister owned such a dagger, having won it from him in a wager. When Ned arrives at last, Littlefinger arranges a meeting, and Eddard is informed of what happened. He sends Catelyn back to Winterfell, since they are convinced they can’t yet make the accusation to the king without more proof. Along the road, however, Catelyn and Ser Rodrik stop at an inn where Tyrion Lannister enters. Having hoped he would not see her, the singer Marillion calls the Imp’s attention to their table and he recognizes her. Feeling forced to act—believing that Tyrion would bear news of her having been in King’s Landing in secret to Cersei and Jaime—Catelyn calls on the loyalty of the Tully bannermen to seize Tyrion and his men, and then claims to be riding for Winterfell. This was aimed to throw off pursuers, and instead she turns east to the high road into the Vale. 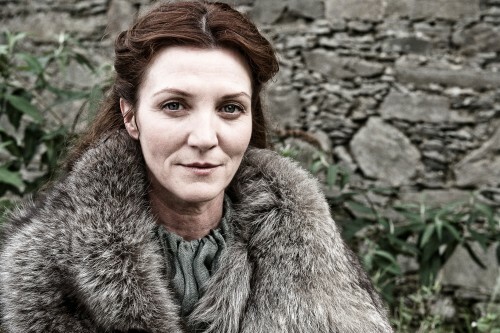 After narrowly surviving attack from the clansmen, they reach the Eyrie where Catelyn receives a cold welcome from her sister, Lysa Arryn, whose young son Robin is still at the breast despite his years. When Tyrion escapes Lysa by calling for a trial by combat, Catelyn and Rodrik depart for the North after failing to convince Lysa to bring the Vale into the war in support of the Starks. They come upon Robb’s camp in time, and Catelyn helps guide Robb and helps see his plans come to fruition by arranging a marriage alliance with House Frey. Robb captures Jaime Lannister and defeats his host, but they soon learn that Lord Eddard has been executed. Both Catelyn and Robb are shattered by the news, and Catelyn swears that once they have her daughters back they’ll exact their vengeance on the Lannisters. Catelyn speaks with the imprisoned Jaime Lannister, striking him when he goads her, and has him admit that Cersei’s children are his own and that he threw Bran from the tower. Later, the northmen hold a council and Lord Umber announces that the only king he’ll follow is Robb: other men take up the call of “The King in the North” while Catelyn sits silent.